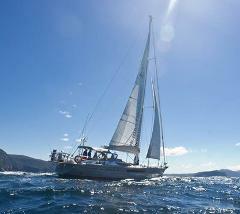 3-hour morning, afternoon or twilight cruise on the wonderful Derwent River. 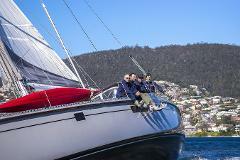 The charter involves sailing on one of the largest and most beautiful natural harbours in the world, with spectacular views of Hobart and Mt Wellington. 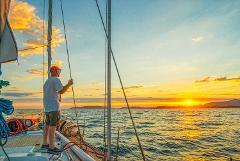 Depending on the weather, this 8-hour cruise will take you to the end of the Derwent River and out into Storm Bay or the more sheltered waters of D'entrecasteaux Channel and Bruny Island. Gourmet lunch and refreshments provided. 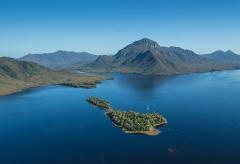 For the memory of a lifetime book on one of our yacht charters to Port Davey and Bathurst Harbour on Tasmania’s rugged west coast. Seven days walk from the nearest road, this journey will change your life. 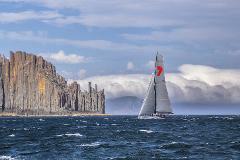 We are offering a unique opportunity for adventure lovers to watch the yachts in the Sydney to Hobart race round the corner on the final leg of this epic race. 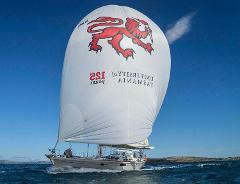 We do a three-day trip, leaving on December 28 and returning on the 30th. 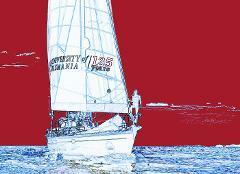 Helsal IV will leave King's Pier Marina at 6:00pm and return at 8:00pm, taking in the city lights of Dark Mofo. 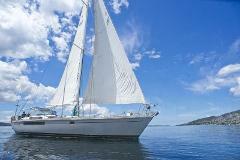 Spend a day sailing to Bruny island for an exquisite seafood lunch and relaxation. Take a turn on the wheel, go for a swim or a walk on the secluded sandy beach, or relax and enjoy your ultimate Tasmanian holiday indulgence.